Ocean Beach San Francisco is a great place to go if you enjoy spending time outdoors, and are looking for a place to get away from the crowds. Stretching roughly 3.5 miles along the west end of the city, Ocean Beach is not a place that is frequented by many tourists. Even San Francisco residents who live on the other side of town, don't often make their way out here. That's because the west side of town has a reputation for always being foggy. Although that's mostly true in the summer, for the rest of the year the weather is pretty much the same as anywhere else in the city. Which means that it's often sunny, like in the image above. 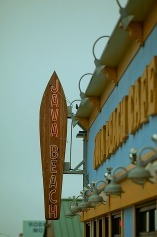 Java Beach Cafe (at Judah and 48th ave). The north side of the beach is where most people go, and there are a lot of worthwhile places to visit nearby such as Lands End, the Cliff House, or Sutro Baths for example. If you want to have the beach mostly to yourself, walk along the sand dunes towards the center of the beach. 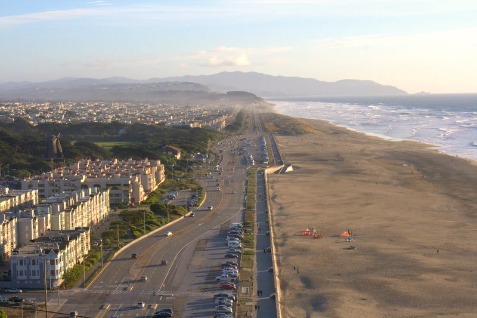 The south end of the beach is close to the San Francisco Zoo, as well as Fort Funston. If you are interested in having a bonfire at Ocean Beach, read about the safety guidelines and rules here. They are only allowed in the designated fire pits located between Lincoln Way and Fulton Street. There are three surf shops in the area, Wise's Surf Shop, Mollusk Surf Shop and Aqua Surf Shop, but Aqua is the only one that has wetsuits and boards available for rent. 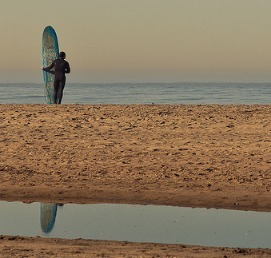 That said, the conditions at Ocean Beach are only suitable for very experienced surfers! It’s unfortunately not a good beach for swimming. The waves are usually big, the rip currents are extremely powerful and the water is freezing cold. Every once in a while I will see some brave (or maybe just crazy?) person getting ready to take a dip in the water, but I don’t recommend it. It is, however, one of the best places in the city to get a view of the sun going down. Really, if you head west from anywhere in the city, you should be able to find it without too much trouble, as Ocean Beach pretty much runs along the whole west side of the city. The fastest is via Pine Street (a one-way street), then make a left on Masonic, and then a right on Fulton Street and follow it all the way to the end where it stops at Ocean Beach. Take Fell (a one-way street), follow it as it turns into Lincoln, and continue on Lincoln all the way to the end where it stops at Ocean Beach. Parking is free, and there are parking lots located at the end of Sloat Boulevard (at the south end of the beach) as well as the west end of Golden Gate Park (at the north end of the beach). There is also street parking along the residential street the Lower Great Highway. Don't mistake this for the actual highway by the same name that runs right next to Ocean Beach, just one street over! The easiest bus to take from downtown is the 38 which you can pick up at Union Square, and runs down Geary taking you very close to Ocean Beach. Bus numbers 5, 18, 31, 31AX, 38, 38X, 38AX and the N-Judah muni line will get you close to the north end of the beach. Bus numbers 16X, 18, 23, 48, 71, 71L and the L-Taraval muni line with get you close the south side of the beach. Bus line number 18 will transport you from the north end to the south end along 46th avenue and vice versa. For a route map, click here. Beach Chalet, which is situated at the west end of Golden Gate Park at 1000 Great Highway. Walk through the doors of the buildilng on the first floor, and you will find them on the right-hand side, underneath the stairway. On the south end of the beach, there are restrooms and outdoor shower facilities located in the parking lot across from Sloat Boulevard. 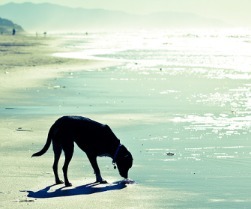 Bring Your Dogs To Ocean Beach! Dogs are allowed at Ocean Beach. 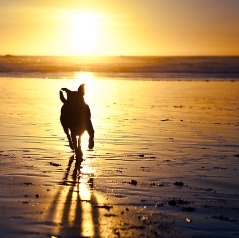 The area between Lincoln Way and the north end of the beach (towards the Cliff House) is a designated off-leash zone, where your furry pet is free to romp around untethered! That means that if you walk south of Lincoln Way on Ocean Beach, you must have your dog on a leash, otherwise you run the risk of getting a ticket! Dogs are very important to many people who live in San Francisco, and there is a constant legal discussion regarding where owners may allow their pets to play leash-free. You may see a bumper sticker while driving around town that reads, "I have a dog and I vote!" 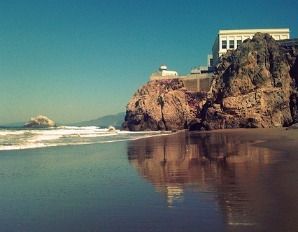 In May, Ocean beach is the “breakers” in San Francisco’s famous annual race - The Bay to Breakers. If you don’t feel like joining the mayhem, you can watch the racers cross the finish line at the beach. In October, Northern California has its biggest Sand Castle Contest at Ocean Beach. In January: If you are here after the Christmas holiday, you might be able to catch the Christmas Tree Burn. It's a massive bonfire that takes place on Ocean Beach. People pile 30+ Christmas trees together and light it up. I'm pretty sure it's not legal, so participate at your own risk.